You know you really should wear sunscreen. And you know the very real risks of skin cancer. But you also know how great you look in that glow. Beauty aside – don’t hit the beach without this essential in your bag. Here are some basics you need to know to stay healthy while travelling and decrease your risks of sun damage – whether you’re an extreme sun-seeker or avoid the heat at all costs. Sunscreen should be applied every day, even if it’s cloudy, and not just in the summer. It helps to prevent skin discoloration, pre-mature aging, and skin cancer. Certain medications can make you more prone to sun damage including some antibiotics and anti-inflammatories. The peak of the sun’s strength is from 11 am to 4 pm. Always pair your sunscreen with sunglasses with UV absorption to protect your eyes, a wide-brimmed hat that provides shade for your face and neck, and especially for children, cover up with clothing for the best sun protection. Harmful rays include both UVA and UVB: UVB radiation causes sunburns and tans while UVA radiation contributes to aging of the skin and melanoma, the most dangerous form of skin cancer. 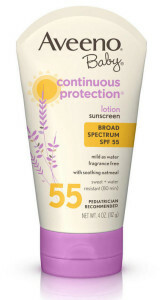 The best sunscreen for maximum protection is one with protection for both UVA and UVB rays (look for “broad spectrum”). We suggest an SPF 30 or higher. SPF 30 can shield 93% of UV rays and the higher you go, the more rays are blocked (SPF 60 can block 97% of UV rays). While the common misconception is that SPF 30 is sufficient, these subtle increases of UV protection do make a difference over the course of a summer. And, for the record, there is no such thing as a base tan – and it will not protect you from getting burnt. Sunscreens are not water proof, rather, some are water resistant, meaning they can only protect you for about 40-80 minutes if the skin gets wet by water or sweat. Look for a water-resistant type, but remember you’ll still need to reapply when you get out of the water and dry off. Search for formulas enriched with vitamins and minerals. Titanium and zinc are the natural ingredients that can block harmful rays. If you don’t like the idea of putting sunscreen on your face, purchase a face specific sunblock or moisturizer with SPF 30 or more. Even lip balms with SPF are recommended. For those with sensitive skin, there are fragrance-free, organic, and even sweat-resistant sunscreens. One of the best sunscreen tips is to avoid sprays and wipes – lotions are the best way to protect yourself and they last longer. If you are using spray, mist your body indoors before heading out into the wind, and have someone reapply to areas you might have missed. For your face, spray the sunscreen on your hands first and rub it on. Apply sunscreen 15-30 minutes before going outdoors and re-apply every two hours or after swimming. Don’t forget easy to miss areas like the tops of your ears and feet. Rule of thumb: A teaspoon of sunscreen is recommended for the face and a shot glass for your body – although we like to be a little more generous! Sunscreen is not something to be stingy on; a bottle should not last you the whole summer. For the beach babe: You’ll need something strong – and we’re not talking about the cocktail you’ll be sipping. If you’re spending a week in the Caribbean during the winter, with a UV Index over 11, you shouldn’t stay in the sun for too long. 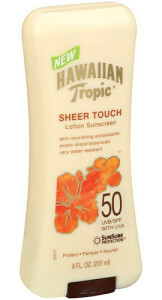 We recommend Hawaiian Tropic’s lotion sunscreen with an SPF of at least 50. Their water resistant Sheer Touch has nourishing antioxidants and keeps your skin feeling moisturized. For sensitive skin: Neutrogena’s fragrance free, hypoallergenic, oil-free sunscreen feels light and doesn’t irritate the skin. For those with acne prone skin – it’s not an excuse to skip the sunscreen – just remember to exfoliate at the end of the day. For a glow: Kate Sommerville’s Body Glow Sunscreen protects your skin while moisturizing, firming, improving the tone and scattering light to give you a healthy glow. For the athlete: Look for an ultra-sweat-proof formula like Coppertone Sport. Since your sports game won’t last all day, the sunscreen should protect you for up to 80 minutes of sweat. For a quick trip outdoors: The easiest way to remember your sunscreen is to add it in your morning routine. Use a moisturizer with built-in SPF so you don’t need to worry about applying it for a quick walk with the dog or visit to the corner store. We suggest Mary Kay’s TimeWise Age-Fighting Moisturizer, with the benefits of an oil-free lotion to hydrate and tone up skin, and SPF protection. For children: Children shouldn’t be out in the sun too long and should wear protective clothing that covers most of their skin when they are. We love Aveeno Baby SPF 55 with its skin soothing oatmeal formula for delicate skin. Nivea and FCB Brazil developed a doll to show the effects of sun damage to children. After not applying sunblock to these dolls, kids are sure to get the message and understand how important it is. 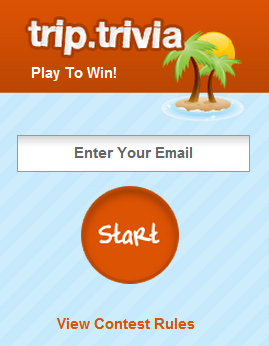 Do you have a favourite brand or sunscreen tips to share? Tell us below! Mexi-tan. Least amount (almost none) of carcinogens and it won’t harm the reef while you are swimming.